EMS training can help you get fit and stay fit faster than ever. 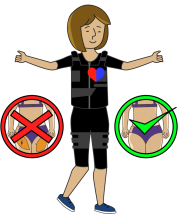 It works by wearing a special suit during exercise. 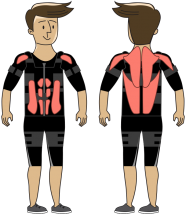 The suit has patches with electrodes that massage the muscle during training, stimulates the metabolism, and speeds up blood circulation – resulting in a more powerful exercise for the muscles and faster results. The result is a more intense workout, where 20 minutes are equivalent to 2-3 hours of workout at a regular gym. Training sessions with a certified personal trainer. 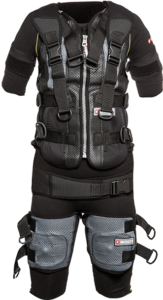 The EMS suit enables working out over 90% of the muscles in every training session. Easy on leg and arm joint as there is no need for heavy weights. Pressotherapy lymphatic drainage session after each workout improves blood circulation by removing excess fluid in the legs. 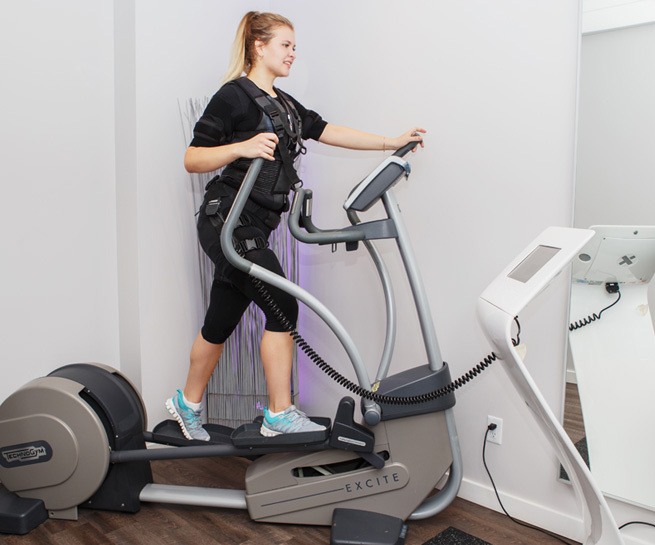 WHAT IS ELECTRICAL MUSCLE STIMULATION (EMS)? 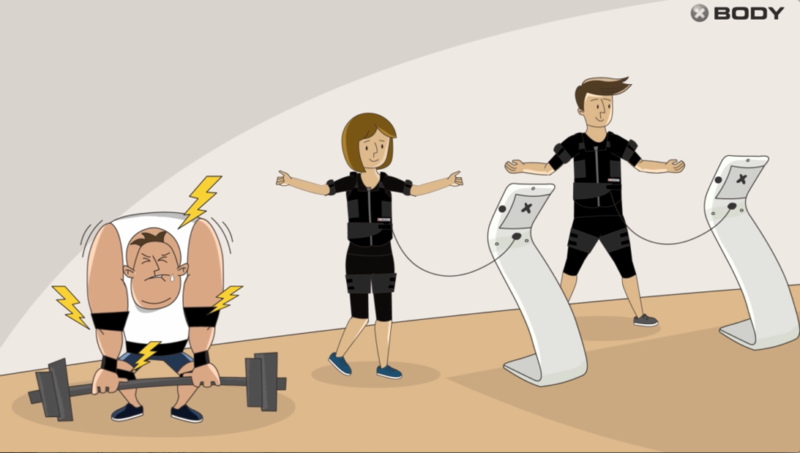 Electrical Muscle Stimulation (EMS) uses small electric impulses to further contract the muscles during exercise movements. Sounds scientific? It’s really simple. 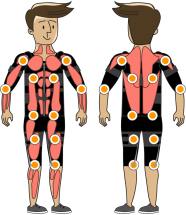 Patches on the suit connected with electrodes send small electric impulses to the muscles. The impulses contract the muscles in a similar way to regular exercise. 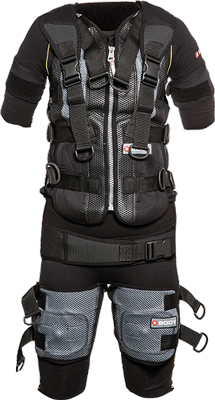 That way, as you move the EMS suit enhances your movements producing a more intense workout. In standard strength training our brain sends impulses that stimulate the muscles to contract – but we don’t have great connections between the brain and every muscle as we get used to activating only some muscles regularly. Unlike regular workouts EMS Training stimulates all of the major muscles. This also helps build the nerve connections between the brain and the muscles – that way even the weak connections get activated. EMS Training activates the muscle fibers in irregular order resulting in a more intense training, which creates more muscle fiber faster. Building more active muscle tissue requires more energy and also burns more calories, even during relation with EMS on! 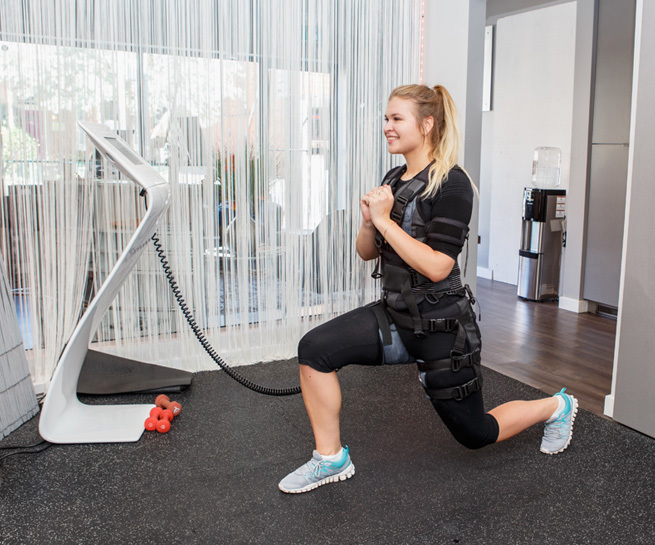 The EMS suit electrodes are placed directly over each major muscle group – making it easy to grow every muscle faster. EMS Training could improve your posture. Our unique training programs include exercises focused on the back, lower back, abs and shoulders. Combining EMS strength training with cardio sessions will tone your muscles, burn fat, and reduce cellulite. The result is improved circulation of the muscular and connective tissues which can also lead to more firm and tones skin. Unlike the standard weight training, EMS Training does not place pressure on the joints. 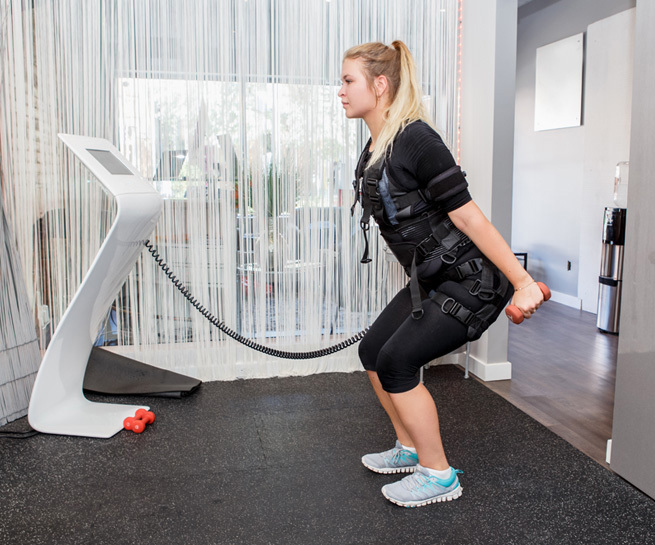 Instead of many joint movements, the EMS system extenuates your movements. Our expert trainers can also help you use EMS to recover for an injury or joint pain. If you have a muscular imbalance or uneven, underdeveloped muscles, EMS can be used to target specific muscle groups. 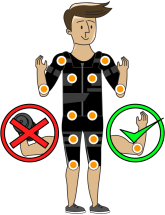 With professional placement of the electrodes on the training suit and corresponding exercises you can balance the body. In today’s busy world there is often no time for lengthy workout sessions. 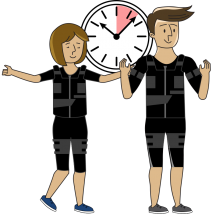 With EMS you can achieve the results of a 90-minute workout in just 20 minutes – which includes strength and cardio training to your preference. Normally when you contract a muscle only about 30% of your muscle fibers actually contract. The other 70% stay dormant and wait to be used once the others tire out. 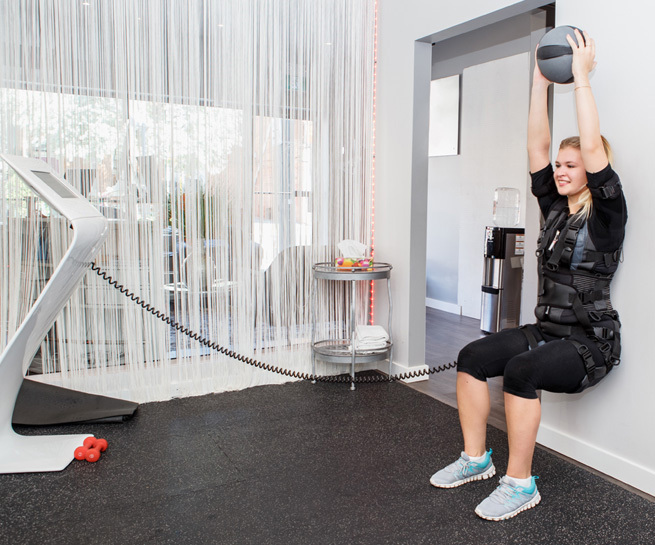 EMS enables you to electrically stimulate these resting muscle fibers and improve their strength. From clinical tests EMS was found to be most effective when muscles are very weak and you have difficulty performing normal anti-gravity exercises. That makes EMS very effective for injury recovery and physiotherapy. Studies found that it takes about 10,000 repetitious movements for your brain to learn how to send a message to specific muscles through the fastest pathway – a “memory pathway” for muscle contraction. The more often your muscle contracts the faster the body finds this pathway. EMS provides you with repeated contractions that speed-up this learning process.